But customers here don’t pay the TV much attention. It’s Monday morning, it’s -5°C and we’re a long way from Tinseltown. Out on the forecourt, Eamon McDevitt is running through the names on today’s passenger list. A cancer survivor himself, he has been providing a free bus service for Donegal patients requiring radiation treatment at University College Hospital, Galway for more than three and a half years. Two of his passengers, William and Margaret from Greencastle, have already been on the road for an hour and a half this morning, driving from their home on the Inishowen peninsula, to take their places on the coach today. 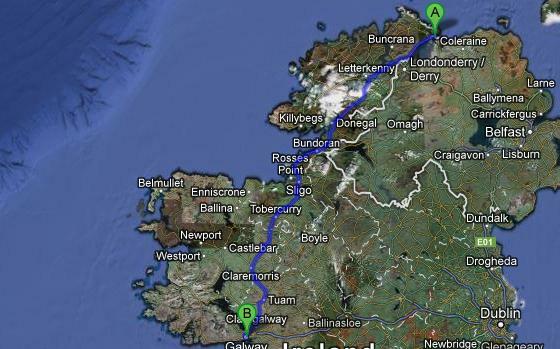 In total, the round trip from Greencastle to Galway is more than 600km. Those who defend the present system point out that centralising cancer services at eight high-grade treatment centres around the country has resulted in an improvement in survival rates. They argue that the northwest does not have a sufficient population base to justify locating a centre there and that it is a mere quirk of history and geography that has left Donegal out on a limb like this. At 7.30am, McDevitt’s creaky, 22-seater coach pulls out onto the N13 with a half dozen people on board. William from Greencastle tells me he has 37 radiotherapy sessions scheduled over eight weeks to treat his prostate cancer. Fortunately, he has secured Monday-Friday accommodation at Inis Aoibhinn, a free residential care centre run by the Cancer Care West charity on the grounds of UCHG. Like almost everyone I speak to today, he bemoans the lack of radiation oncology services in the northwest. But he cannot speak highly enough of the treatment he is receiving in Galway. He has his own room, a shower and tea-making facilities. His wife Margaret is welcome to stay and there’s always something on in the evenings. At Kilross, there’s a parked car waiting for us on the roadside. A mother and daughter say their goodbyes. A few minutes later we reach our second pick-up point outside Ballybofay, where two more parked cars are waiting. McDevitt greets everyone warmly, welcomes them aboard and reminds us again to keep our seatbelts fastened. But what’s most notable is how effectively he manages to keep things moving. The passengers are mostly older people. Some are travelling on the bus for the first time. They have loved ones to see off and baggage to stow. But delays are kept to a minimum. Everything proceeds with military precision. 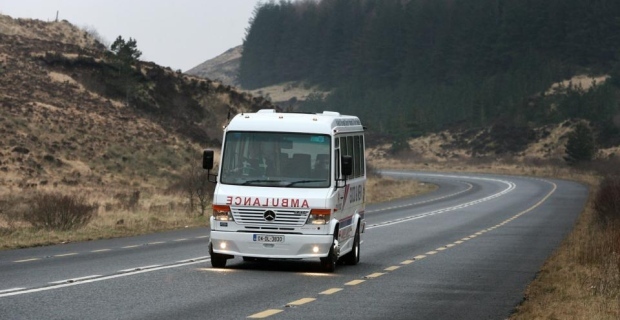 When the Minister for Health cut subsidised bus services for Donegal cancer patients last year, he suggested public transport as a viable alternative. But the scheduled Bus Éireann service from Letterkenny to Galway takes five hours. Some cancer patients are obliged to drink three litres of water before receiving radiation treatment, meaning they would have to be nappied to make the journey without toilet stops. I look out the window and imagine how I would feel if a member of my family had to endure these sorts of indignities. To our left, an icy Lough Mourne glistens in the early morning sunshine. At eight o’clock, the bus whistles through the Barnesmore Gap into south Donegal. On the radio, EU economics and monetary commissioner Olli Rehn tells Morning Ireland that ¤1 billion in savings the country made from the recent promissory note deal should not be regarded as a “windfall gain” for our economy. The friend casts a furtive glance sideways, to see if the journalist onboard is listening. Then the pair chuckle amongst themselves. Anne from Ballybofay is four weeks into a six-week programme of treatment for breast cancer. She says she loves Galway. She loves Inis Aoibhinn. She enjoys the massages on offer, the reflexology and nightly card games. Country singer John McNicholl and his band came to perform for them last week, she tells me. Even Daniel O’Donnell has been known to drop by occasionally. Up front, the male passengers are giving Eamon McDevitt some flack for his reluctance to overtake a slow-moving cattle trailer ahead. The final insult comes when both vehicles are overtaken by a truck carrying a mobile home on its trailer. This provokes a debate about overtaking in general, and whether or not it is illegal to overtake a school bus in the US. By 8.45am, the frost has cleared. The radio is pumping out a solid diet of country n’ Irish and we’re enjoying glorious views of the sea at Mullaghmore. Having collected more passengers in Donegal town, Ballyshannon and Bundoran, we stop for our first toilet break at a Texaco station near the foot of Ben Bulben, in Grange, Co Sligo. I get talking to Frank and Margaret from Donegal town. Frank is a retired engineer, Margaret a retired nurse. This is Frank’s second week of treatment for prostate cancer. Last week they stayed in a hotel and it was quite lonely. The radiation treatment itself only takes about 15 minutes. So they were left with 23 hours of the day to fill. This week, they’ve gotten a place in Inis Aoibhinn. Margaret admits she hadn’t known Galway at all before this, but has come to love the city. “The shops, you mean,” smiles Frank. They’ve both been for long walks on the seafront at Salthill. Did they kick the wall at the end of the promenade, I ask? No, admits Margaret. They only recently learned about that Galway tradition. “So we’ll owe the wall a few kicks the next time we’re there,” she says. Shortly after 9am, the bus rattles through Sligo town and hits the west of Ireland’s answer to Route 66, the N17. In a literal, figurative and spiritual sense, now we’re suckin’ diesel. The far side of Collooney, we encounter that truck carrying a mobile home on its back again. Alas, our friend has flown too close to the sun this morning. He is broken down on the hard shoulder. I give him a condescending salute as we overtake. A sign says “Galway 128km”. Almost halfway there now. By 9.45am, we’ve passed through Tubbercurry and Charlestown and now Knock airport is looming into view on the horizon. During our next toilet break, I’m approached by Donal from Bundoran. He wants me to know that, as a member of a political party he is too ashamed now to identify (I can guess), he once campaigned against the closure of breast cancer services in Sligo. But such is his admiration for the standard of care in Galway, he says, that he has changed his mind on the issue. Amongst passengers from north Donegal, that’s not a popular opinion. Eamon McDevitt, for one, while recognising the excellent care patients receive in Galway, nonetheless insists that a facility of the same standard should exist in the northwest. He recalls a conversation he had with consultant oncologist (and now senator) Prof John Crown. After Tuam, the landscape changes dramatically. The soft and craggy boglands of the northwest give way to the flat green fields and neat stone walls of east Co Galway. I ask McDevitt about the long heralded panacea to all of Donegal’s cancer woes, the proposed radiotherapy facility at Altnagelvin Hospital in Derry. We’re now crawling through Claregalway, on the home stretch. McDevitt shares a couple of anecdotes about the aftermath of the withdrawal of the subsidised door-to-door bus service to Dublin. One recovering Donegal cancer patient, aged 82, was called to Dublin for a follow-up visit. It was the first time he had made his way to the hospital on public transport. By the time he arrived at Busáras, he had become confused and could no longer recall his own name nor what he was doing in Dublin. It was left to a good Samaritan, who happened to be passing, to search his pockets, find the letter containing details of his appointment and get in touch with the hospital. A taxi driver brought the man to the hospital and waited with him until he was admitted. At 11.15am, we cross the Quincentennial Bridge in Galway and 10 minutes later we’re pulling up in the grounds of University College Hospital. We’ve made it in just under four hours, an hour faster than CIE. The following evening, I speak to McDevitt on the phone. It took five months of persuasion before I was allowed to travel with him and, even now, he still seems a little apprehensive about what I will write. He tells me how his own wife got breast cancer in 1996, when she was just 36 year old. Their youngest child was six weeks old at the time. She received chemotherapy and has since made a full recovery. That was the beginning of his involvement in cancer fundraising. He mentions AXA Insurance in Letterkenny, who have insured the charity’s nine-seater bus free of charge, and begs that I mention them in my article. UPDATE (18/10/2013): Thanks to everyone for the huge response to this article. We’ve just set up a page where you can all DONATE. PLEASE DO! The Good and New Facebook page is here if any of you want to get in touch with Eamon that way. I have voted and I will remember this article the next time there is an election. A very honest and accurate description of the circumstances being experienced by cancer sufferers in the North-west and what they must go through in order to get treatment for their conditions. A year on and still no change, no Altnagelvin, nothing but another winter of travel extremely early in dark mornings on sometimes dangerous roads. Ask someone in Fanad, Malin or Dungloe if taking 2 hours off this journey, one way, would be a help, and that still means a trip to Sligo. Surely there must be someone in authority who realises this is just not acceptable in a so called “First World” country. Its high time that cancer sufferers in the NW were treated with a bit of dignity. Fair play to Eamonn McDaid and indeed the writer of this article. Support their fundraising efforts, you never know when you might need this great service. What a brilliant story showing bravery and humanity in the face of this government’s inhumanity. I’ve done this journey with a relative, and it’s a SIN that people in the depths of cancer treatment have to go through this. God bless you Eamonn McDevitt for the effort and heart you give in driving all that way for no payment. Why isn’t there a cancer treatment centre in the Northwest?